The second instalment of our very special crochet along 'The Sweetpea Blanket CAL' is here. 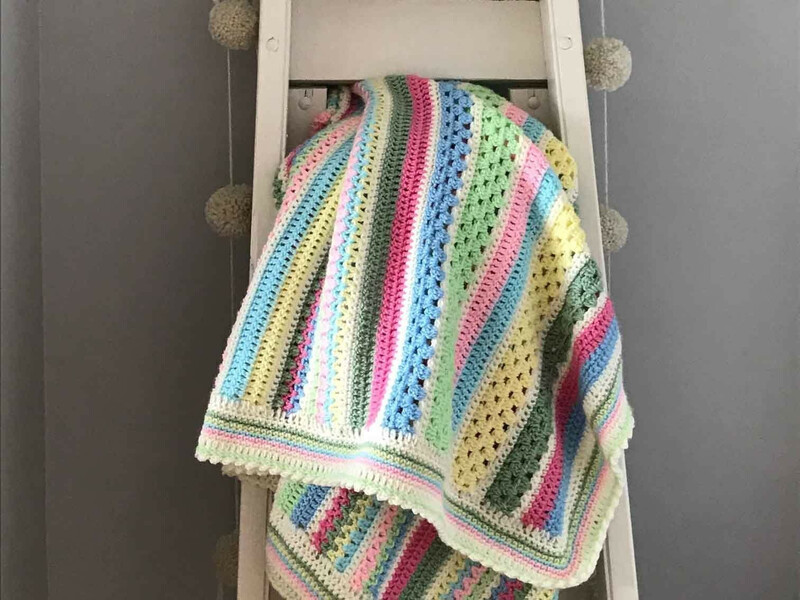 Designed by Sue Rawlinson of Sweetpea Family Crochet this delightful spring blanket is made up of simple crochet stitches and is suitable for beginners. We hope you have all enjoyed part one and are ready for part two! You can still get hold of the exclusive yarn colour pack for just £15.99. The pack includes all the yarn you need to crochet up your own blanket. Read about how Sue Rawlinson became such a successful crochet influencer and designer in our exclusive interview. We have loved seeing all of your progress photos on the Facebook page over the past week, thank you to all of you that are taking part! Please continue to share your progress! Sandra Miller was very quick to crochet up part one, absolutely gorgeous! Alison Keogh completed hers in time for Easter! Lovely colours. Rachel Brass was super speedy too! Beautiful. Catherine Chapman shared this gorgeous progress picture, nearly there! Pauline Maddocks enjoyed crocheting part one as well. So lovely! Keep scrolling for a helpful guide on how to crochet the blanket, and the stitches used. For part two, you are continuing the stitches used in part one, but also with an added V stitch. 41st and 42th rows: Work 1ch in cream, then 1dc in each stitch to end. At the end of row 42, change to Lemon. Next you will work the first V stitch row. 43rd row: 3ch, and then skip st at base of 3ch, then work 2tr in next st. Skip the next st, then work 2tr in next st.
Once you get to the last 2 sts, skip next st, and work 1tr in last st. Change to Blue in the last st.
That is your first row of V stitch worked. Next work your second V stitch row. 44th row: Work 3ch, then work 2tr in space between the next 2tr gap. Continue in this way to end of row, referring to the pattern. Change to Light Pink on the last st.
Continue with your project using your pattern as a guide. That's it for part two. We hope you enjoyed it and are looking forward to part three. It will be released on 13th April so stay tuned! Please share your progress with fellow crocheters over on The Knitting Network's Crochet Along Facebook page. As well as sharing tips, asking for advice and sharing any queries you may have.